Global markets witnessed a remarkable bounce-back in January led by improved risk appetite and hopes of policy action driven growth momentum. Upbeat economic data from U.S and China lifted the sentiments worldwide and abetted equities to rally through the month. Copious FII inflows, shift in monetary policy stance and largely in-line domestic corporate results boosted the Indian markets performance further. The benchmark Sensex rose sharply by 11.2% during the month and closed at 17193 points. With about a 7% rise in rupee against the USD, MSCI India was among the best performers in Emerging Markets with a 20.8% rise. The mid and small cap indices outpaced the large caps by increasing 14.4% and 16.5% respectively. FIIs were aggressive net-buyers of about USD 2.03bn worth of stocks whereas domestic funds were on the selling side taking out USD 371.62 mn. Liquidity revives Sentiments; Can they ensure growth? European Central Bank’s gargantuan refinancing effort (nearly half trillion Euros credit line to European Banks against their illiquid securities) is far greater than all forecasts and could turn out to be a game changer for the regional crisis if the banks utilize the funds to re-build their capital and core lending business instead of buying bonds. Further, the U.S Fed’s comments about maintaining interest rates at near zero levels until 2014 (earlier it was 2013) has minimized the possibility of liquidity crunch induced global slow-down. Meanwhile, IMF has reduced 2012 global growth forecasts to 3.3% from 4% citing increased downside risks – advanced economies to grow by 1.2% instead of 1.9% and emerging economies to grow by 5.4%. Given the revival in liquidity and sentiments, it will be interesting to wait and watch if the actual growth turns out to be better or not. 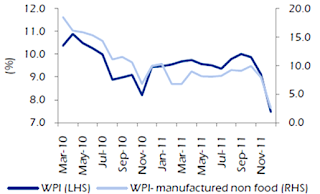 The industrial production growth of November 2011 jumped to 5.9%, as against the street expectations of 2.1%, reversing the steep decline of 4.7% reported in October. The sharp rebound was led by consumer goods that grew by 13.1%. Both the credit as well as deposit growth for December have accelerated to 17% levels. Headline WPI inflation for December eased sharply to 7.47% (a 2-year low) from 9.11% in November, reflecting both seasonal drop in food prices and favorable base effect. However manufactured inflation continued to remain sticky at elevated level of 7.41%, slightly lower than 7.7% recorded in November. We expect the headline inflation to trend below 7% in the coming months. 2. The recent Supreme Court verdict cancelling the 2G licenses awarded in 2008 has thrown open the possibility of auctioning the restored spectrum at market driven ates (2010 3G auctions fetched USD 15 bn). Further, the steep 7% appreciation of Rupee against the dollar in January (highest monthly gain since 1980) and the continuing trend in early February would ease some pressure off the government’s crude oil imports amidst its forex reserves dropping to a 17-month low. Both IMF as well as RBI are of the opinion that FY13 GDP growth would be better than FY12 growth. In fact, IMF has pegged the FY13 growth at 7.3% while bringing down the FY12 number to 7%. The central bank, in its recent review, surprised the markets with a CRR cut of 50bps while leaving the repo rate unchanged at 8.5%. The Cash Reserve Ratio cut will inject primary liquidity of Rs.320bn into the system and would help in addressing the structural liquidity deficit seen in recent months (LAF deficit had gone up to Rs.150bn). 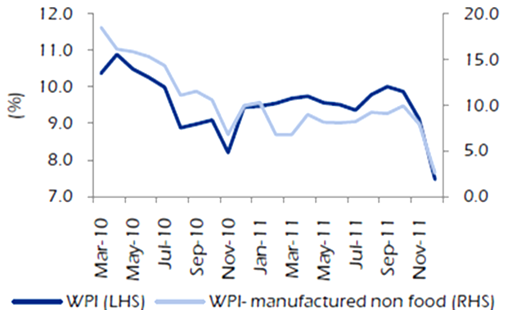 However, RBI considers that rate cuts are not warranted at this juncture as upside risks to inflation persist. The policy document indicates that a reduction in the policy rate will depend upon ‘signs of sustainable moderation in inflation’. In our opinion, RBI will wait for the FY 2013 Union Budget to be presented in parliament, (during mid-march) before making any decisive move on rate cuts. The RBI has reiterated its concerns about the rising fiscal deficit besides revising its FY12E GDP growth target downwards from 7.6% to 7%. RBI retained its inflation estimates for year-end March ’12 at 7%, considering the lagged impact of the rupee depreciation. On the whole, it is clear that the growth-inflation balancing stance of the monetary policy stance has now decisively shifted towards supporting growth. After ending 2011 as the 2nd worst performing emerging market, Indian markets have rebounded sharply in the first month of 2012 aided by a host of positive global as well as domestic cues. The activity in bourses has also gained momentum with average cash volumes touching a 13-month high. 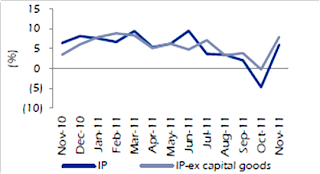 Besides the CRR cut and EU developments, the Q3FY12 (Oct to Dec 2012) results of corporate India have also been supportive of market rally. At little more than the half way mark, the consolidated performance of BSE 200 companies that have declared their results so far have been marginally ahead of consensus expectations. Topline growth has been fairly robust at 25.6% yoy punctuated by shrinking EBIDTA margins (17.4% in Q3FY12 vs. 21.2% in Q3FY11) and earnings growth of 5.6% year-on-year. 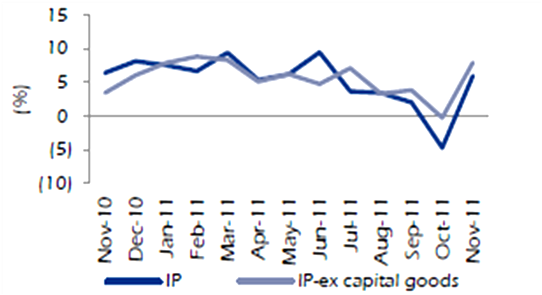 Most importantly, the overall downgrade cycle has been relatively benign with a 1% cut in FY13 Sensex EPS so far. The upcoming central budget is going to be a very important event in the near term and would provide indicators as to how the government proposes to move ahead with policy reforms and fix problems in infrastructure, power and mining. Considering the fiscal deficit, the budget per se may not be corporate friendly as there is a possibility of increase in all taxes ranging from excise duty, service tax to surcharge on corporate tax. Nevertheless, a bullish view on India could emerge from better governance and policy reforms which would determine the sustainable long-term growth trajectory. The quick rebound from the 2008 crisis lulled the policymakers into believing that 9% growth was routine and double digit increases were round the corner. However, 2011 has provided a clear warning that poor governance would significantly jeopardize the India growth story. Going by the recent posture of the government in terms of fast tracking project approvals and resumption of concerted efforts to clear pending bills, it appears that introspection is on and amends would be made going forward.